El laughing stock (o laughingstock, todo junto) es ni más ni menos que al hazmerreír, esa persona que por su apariencia o sus actos ridículos o extravagantes divierte a los demás. Laughing stock se usa igual que nuestro hazmerreír. 1) I can't wear this ridiculous shirt to the concert. I'm going to be the laughing stock! 2) The candidate became the laughingstock of the political world after promising to lift restrictions on the dollar on the first day of his term. 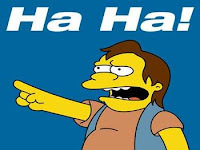 3) The player who missed the last penalty has become the laughingstock of the tournament.